I thought I'd do something a little different today and discuss university. Last week I finished my degree so I feel I'm somewhat experienced enough to talk about whether going to university is worth it or not. With the rise in fee's (which I managed to avoid thankfully) and a degree now not even guaranteeing you a job it can seem like university is just an expensive waste of time. For this post I've got Josh to offer his opinion too as we both went to the same university and did the same degree so I thought it would be good to get another opinion as well as mine. Obviously these are just our thoughts and opinions of our time at university and experiences differ person to person so we're not saying we these experiences are or are going to be the same for everyone. Also this is purely about university as a whole not our specific degree (although I will be doing a post on that next week). and decided to live together in student accommodation owned by a private company not the university, it's basically a studio apartment. We've lived in the same building and in the same room for our entire time at university so we haven't done the typical student thing of living in halls or a shared house. I went straight from college, although I did do an extra year at college rather than the average two, to university so I had no break from education. Josh also did three years at college but left in 2008 and had a couple of jobs over the two years between college and university. I was never 100% set on going to university or doing the degree I did and it was all sort of on a whim for me. I picked Coventry because the only university I really wanted to go to outright rejected my application (just so you know Liverpool John Moores uni I've never got over that rejection!) so again it was a bit of a whim, it was also the university that was the furthest away from home and if I was going to move I was going to do it properly. Josh received unconditional offers from all the university (not that I'm jealous or anything) but if we're being honest he only came to university because I did. Lauren: For me I'd 100% say it's been worth it. The university experience as a whole is one that I've really enjoyed. I haven't had the typical student experience of living in shared housing or getting drunk most nights but then again I'm not that sort of person. Instead coming to university allowed me to spend 3 years living with Josh and doing all the stuff we love to do. There's been times I've questioned whether uni is worth it as my degree wasn't that best ever but I honestly think it has, I've visited places I'd would never have visited if I hadn't moved here and truthfully I have had 3 pretty idyllic years. I didn't have a job whilst at uni so my spare time has been used for blogging, days out, TV series marathon's and movie days and I know that when I do have a job it's going to be a time I look back on with fond memories and be thankful that I had a time in my life where I could pretty much do what I wanted. Before coming to uni I went to college and worked in a pub restaurant on Friday and Saturday nights then all day Sunday's so I didn't really get to do much. Yes university is expensive and yes looking for a job afterwards is extremely difficult but I wouldn't change anything, being a student is just about one of the best things in the world and I'd do it all again in a heartbeat. If you have to opportunity to go to uni you should definitely do it, it's anexpensive life experience but one that's completely worth it. Josh: Is uni worth it? Good question. Simple answer: no. It's been an experience, I've moved out, met new people, been to new places, so in that respect coming to uni has been great. But having the 'pleasure' of paying however-many-thousand pounds per year for three years to learn stuff I could have learnt for free from Google in 15 mins has really made actually coming to university not worth it. It's a rip off and now that fees have gone up it's even more of a rip off. And then getting a degree means nothing anyway as everyone is getting them, therefore devaluing them. THEN when you have one all the jobs don't really care about your degree anyway and just want you to have experience before they'll even consider you. So my message to college students looking to go to university is...forget uni! Get a job as soon as you can and work your way up from the bottom. Granted, while the people that go to uni will be out having fun while you're busy working away, by the time they finish university you'll be well up the ladder. 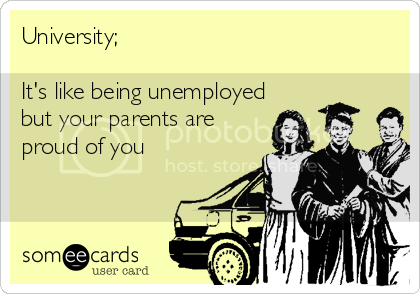 The university student and their all but worthless degree will still have to start from the bottom! And don't get me started on all the debt you'll be in... It's been fun, and it's been an experience, but in no way shape or form would I recommend it. If you have any question's for us or any future posts you would like to see about the topic of university please leave a comment. Also I'd love to hear whether other people think going to uni is worth it or not. Next week Josh and I will be offering our opinions on the degree we did; Journalism and English. This is such an interesting post. I've been planning to tackle this topic on my blog for a little while now too. I feel that uni's been worthwhile for me not because of what I've achieved or studied as part of my course, but of what it's allowed me time to pursue outside of studying. BUT I only paid 3k per year, so no way would I think it was worthwhile to pay 9k per year and not enjoy/benefit from the course I was studying. Such a tricky one, isn't it?